Struggling to find work, an ex-alcoholic finds himself in the employ of a sinister and dangerous group. The 1970s was the golden age of the political conspiracy thriller, with a raft of movies in which everymen found themselves out of their depth and involved in some sort of shady political shenanigans. It's a sub-genre that gave us some of the best films of arguably the greatest era for American cinema - The Conversation, All the President's Men, The Parallax View etc. The aforementioned movies and their ilk are clearly an influence on first-time director Thomas Kruithof, who blends in such fictional exemplars with some inspiration from real-life French history. The always great Francois Cluzet is the everyman in question here; his protagonist, Duval, is a mild-mannered former accountant and ex-alcoholic who has spent two years struggling to find employment after his fondness for the sauce cost him his book-keeping career. When he receives a late-night phone call from a mysterious man named Clement (Denis Podalydes), requesting he pop in for an interview the next day, Duval is thrilled. At the interview, it's established that Clement may not be entirely above board, asking odd questions regarding Duval's political beliefs. Duval is given the position however, which involves him spending his days in an empty apartment transcribing the contents of tapped phone calls on an old school analog typewriter. Listening to one of the tapes, Duval hears what sounds like a violent confrontation, which he later discovers, through a newspaper headline, was the murder of a political figure. He's all set to hand in his notice when another mysterious employee of Clement's, Gerfaut (Simon Abkarian), arrives on the scene. Before he knows it, Duval is an accomplice to murder, finding himself torn between his shady employer and the French secret service. Few actors are so adept at the not so simple task of reacting as Cluzet. Think of his expressions of joy while listening to his jazz idol in Bertrand Tavernier's Round Midnight, or when he learns his wife may still be alive in Guillaume Canet's Tell No One. There aren't many opportunities to express joy in the plot of Scribe, but Cluzet is a perfect choice for a role that requires him to spend much of the running time listening and reacting. 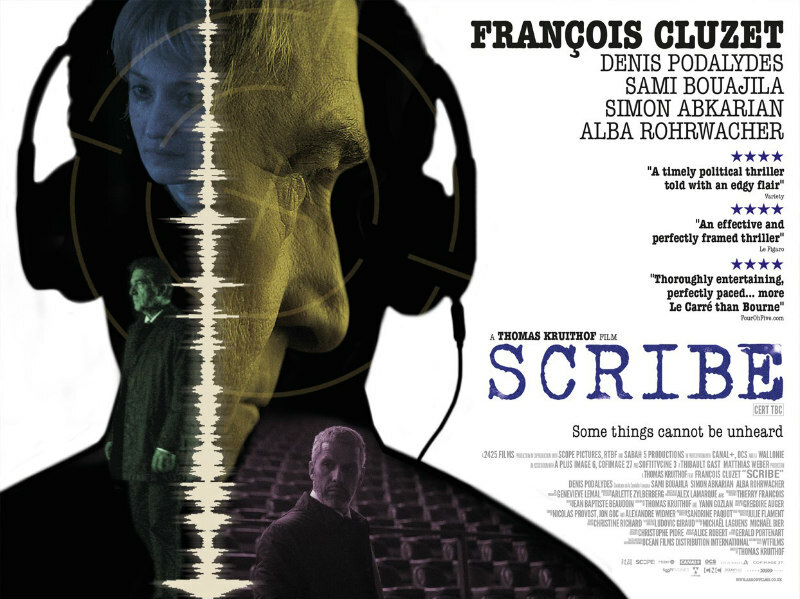 For its first half, thanks chiefly to Cluzet's sympathetic sad-sack performance, Scribe is a compelling thriller that keeps us guessing. It's when the details of the conspiracy in hand start to be revealed that the film becomes a lot less intriguing, getting bogged down in plot reveals rather than ambiguous mystery. A subplot involving an enigmatic young woman who befriends Duval at his AA meetings gives us some nicely played scenes between Cluzet and Alba Rohrwacher, but leads to a predictable resolution. The real-life inspiration for Scribe comes from the dodgy dealings of French Prime Minister Jacques Chirac. In the run up to the 1984 French election, three French citizens were held hostage in Lebanon, a situation Chirac used to his advantage, secretly negotiating for the hostages' release to be delayed until after the election to boost his campaign chances. Sometimes truth is more dramatic than fiction, and I can't help but wish Kruithof had given us a straight adaptation of this murky chapter of French political history rather than his fictionalised version. Scribe is in UK cinemas July 21st.